Find out what our experts have to say about Hero Splendor! The least priced variant is Hero Splendor Plus Kick Spoke priced at Rs. 59,807 and the most priced variant is Hero Splendor Plus IBS i3S priced at Rs. 64,038. Choose the Hero Splendor which fits the bill of you. 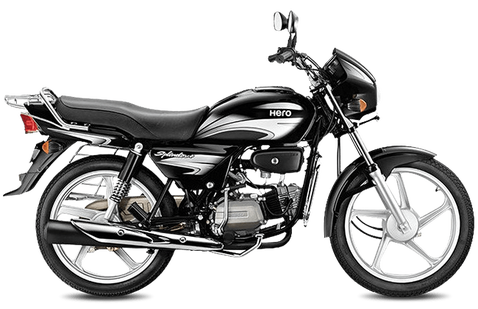 Regarding the design of the Splendor Plus, Hero has decided to maintain the simple and basic look that has worked for the past 25 years. This tried and tested design appeals to the majority of consumers who are planning to buy a low-cost commuter. It is simple yet sober body design now flaunts new graphic designs to give it a refreshed look. The same headlight is carried forward with the similar looking front faring. Tank and side panels are the same but with new graphics and a 3D Splendor+ logo looks attractive. On the rear, the tail light design is the same coupled with the turn indicators. Grab bar is extended as a luggage rack is done in chrome. The seat is long as well as comfortable and works best for city commutes without giving the rider or the pillion any fatigues. Chain cover is still made of metal, unlike others who provide the fiber ones. Instrument console of the bike is still analogue with clear readout including speedometer, odometer, and a fuel gauge. It would have been better if Hero would have included a digital console, but maybe this was done to keep the costs down. Hero Splendor Plus now comes in nine amazing colour options. These colours are Candy Red, Cloud Silver, High Granite Blue, Excellent Blue, Black with Purple Red, Black with Purple, Black with Purple Silver, Palace Maroon, and Black with Silver. Although Splendor Plus is a basic commuter from Hero, it comes with a robust engine. The famed motorcycle is powered by a 97.2cc, air-cooled, 4-stroke single cylinder, OHC unit. This humble mill produces a max power of 8.36PS at 8000rpm with a peak torque of 8.05Nm at 5000rpm. Transmission from the engine to the wheels is provided by a 4-speed gearbox which is very smooth while shifting. Splendor Plus now comes with a unique and revolutionary i3s technology from Hero that not only saves fuel but also helps reduce the overall pollution. This i3s works when you put your bike in neutral, it turns off automatically after idling for 5 seconds. To start the bike again all you need to do is press the clutch and the bike is up and running in no time. This special system helps provide an amazing mileage of 80kmpl. Top speed of the bike is 87kmph and the fuel tank capacity is 11litres. The Splendor is known for its quality as well as reliability and the 2018 version has the same characteristics as well. With an amazing ride quality and a comfortable seat, traveling in this commuter is a breeze. Upright riding posture coupled with the light weight of the bike makes it easy to flick in the city traffic. The suspension is standard yet robust with twin telescopic hydraulic shock absorbers at front and swing arm with hydraulic shock absorbers at the rear. Braking is commanded by 130mm front drum brake and a 110mm rear drum brake which is basic yet decent. Alloy wheels are provided as an option to the standard 18-inch spoke wheels. These wheels are covered with 2.75 x 18 - 42 P / 4 PR section tyre on the front while the rear gets a 2.75 x 18 - 48 P / 6 PR section tyre and work well on Indian road conditions. Being a very basic commuter bike, the Hero Splendor Plus comes with basic safety and features. Now with the mandatory AHO feature, (thanks to the BSIV compliance), the headlight on the motorcycle always stays on. This is indeed a very useful feature as it increases the visibility of the bike during any weather conditions prevailing and keeps the rider safe. The Splendor Plus also features a strong chrome luggage rack which can come in handy to strap in some light luggage while commuting on this bike.